Is it just me or could they just as well be saying “we can’t promise you any kind of real quality, but it’ll be quirky and fun!”? So, a mystery thriller and a zillion suspects, huh? Well, we’ll see about that. And just so you know, this is a looooong summary. The three new recruits take on the identities of Ape-Man, Frog-Man and Bird-Man. They may look silly, but they are totally cool. Nah, who am I kidding? They’re really not. Either way, the organizer plans to use the four to unleash a crimewave unlike the city has ever seen, as it turns out in an attempt to sway public opinion in favor of the Reform Party, the same party which has just asked Foggy to run for district attorney. While these evil-doers plot their villainous schemes, Matt and Karen decide to accompany Foggy and his girlfriend Debbie to an event held by the Reform Party on board a yacht. Matt soon picks up a radio signal(!) from the Organizer and deduces that it’s coming from the yacht and hence someone who belongs to the Reform Party. He goes after Frog-Man in the water and the team’s plan of going about their crime wave without interruption is in serious trouble. 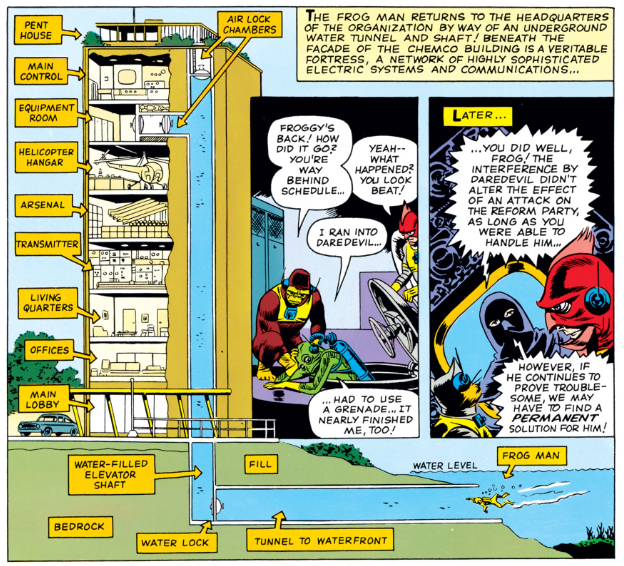 Frog-Man escapes, returns to the headquarters, and the Organizer instructs his crew to find a “permanent solution” if Daredevil proves troublesome. 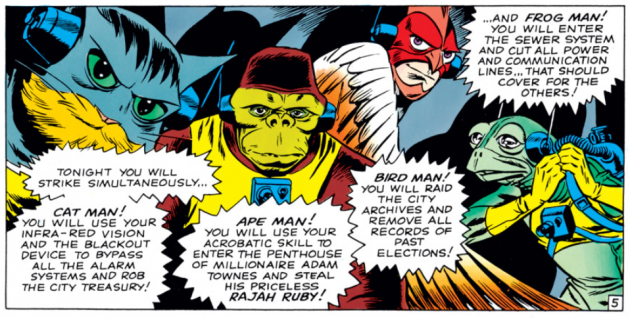 The plan goes ahead to create the illusion of wanting to attack the Reform Party, with Bird-Man stealing the campaign funds and Daredevil catching him in the act and taking the money. This leads the Organizer to decide that it’s time to eliminate DD. The plan is to continue the crime wave while also getting DD into trouble with the law. It seems like these guys aren’t so bad after all. Couldn’t they just plan to have him killed? Seems like less work to me. The way they go about miscrediting him seems a little far-fetched: Daredevil responds to cries of help from a bank. It’s not being robbed, but someone has apparently been trapped inside the vault and is at risk of suffocating. DD uses his superpowers to open the safe by “seeing” into the lock with his radar sense (eh, what?). What happened to just listening to the tumblers fall into place? Either way, Daredevil saves the day, but immediately realizes that something is wrong when Cat-Man and Frog-Man greet him on the other side. They spray him with some gas and he loses consiousness until the sounds of sirens awaken him. This is where logic is stretched to the max as DD decides he has to get out of there since he’ll “never be able to convince them [he] wasn’t part of the plot…” Why not? In fact, there’s nothing to suggest he wasn’t acting in good faith. Oh well, now he’s on the run from the law. However will this end? 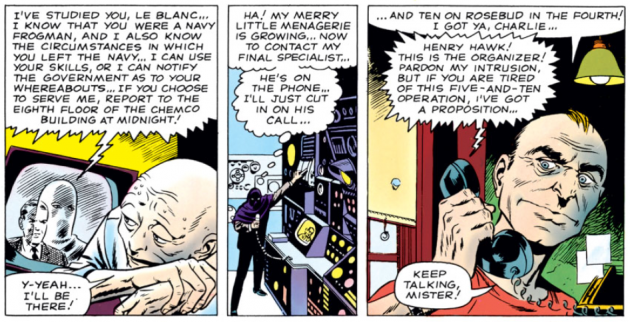 As Stan takes over the writing, Bird-Man shows up again for a re-match. DD manages to escape and returns to rescue Debbie Harris, whether she wants it or not. He’s hoping that she’ll lead him to the Organizer himself, but she instead just calls him for new orders, which are to concentrate on Foggy. Daredevil watches helplessly as his best friend is being played. Matt gathers even more evidence against the Reform Party when he changes to civilian clothes and attends the ongoing interrogations of Cat-Man, and decides to confront Foggy with the suspicion that the Reform Party might be using him as a pawn. Foggy accuses Matt of being jealous of his success, though he does agree to the trap Matt wants to set to test his theory. They invite Bernard Harris, Debbie’s father and Reform Party candidate for mayor, Abner Jonas, the mayoral candidate, and assembly candidate Milton Monroe. Matt and Foggy stage their own ruse by telling the men present that they’ve discovered the identity of the Organizer and that the information has been locked in their office safe. Later, Matt, Foggy and Karen return to the office to find it in shambles, and Foggy finally believes what Matt has been trying to tell him. Their trail runs cold, however, until they get some help from an unexpected source. When Debbie learns that the Organizer is looking to have the current mayor killed, she feels that he has gone too far. She decides to cooperate with Daredevil and agrees to call one of the Organizer’s men to set a trap. In classic comic book fashion, Daredevil subdues Frog-Man when he shows up at the Harris residence and does a little costume swapping. Wearing Frog-Man’s green threads, Daredevil drops off the unconscious villain, dressed in his costume, outside the police station. I love Matt’s comment here: “Wish I could see how he looks in my costume! I’ll bet he’s a living doll!” And yes, he does look sort of cute. Attached to the unconscious Frogdevil is a note instructing the police to listen into the Organizer’s wavelength. The very same radio beam Daredevil uses to find the Organizer. While Daredevil is confronting the Organizer, the police listening in decide that this would make for good TV and start broadcasting live from the camera in the Frog suit. Since the Organizer apparently doesn’t want to miss his “stories,” he’s got the TV on as well and is clued in on “Frog-Man’s” deception. The rest of the crew attack and Matt is tossed out of the room through a trap door. Matt can actually pick up on and understand the content of a radio signal. Hahahaha… Yeah. *wipes away tears of laughter* For anyone who’s interested, I already mocked this instance of dubious pseudo-science in an earlier post. Daredevil appears to be very perplexed by the idea that the organizer, apparently a member of the Reform Party, would send his goons to rob his own party. This is a little amusing in light of the fact that he showed up at the party’s headquarters telling the readers that he had a hunch someone would try to pull something like that. The wonderful obsession with precise and pedagogical charts to show us the exact layout of the organizer’s hide-out. Do note that they even pointed out Frog-Man as he enters through a tunnel below the surface. Now, how cute is that? Well, I gotta tell ya, this issue is a crazy roller-coaster of a ride. I think I’m feeling dizzy. Better go lay down. I’ll see you all later! Let’s see if he makes the cut. If I had a helicopter, am the only one that would keep it on (or at least NEAR) the top floor? There doesn’t appear to be a door, so how do you get the helicopter out? ?